On Tuesday, a federal judge struck down the infamous citizenship question. 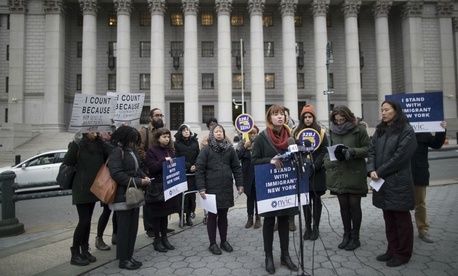 Judge Jesse M. Furman, in the Southern District of New York, decided to block the Commerce Department from “adding a citizenship question to the 2020 census questionnaire,” a decision informed by what Furman found was clear evidence that Commerce Secretary Wilbur Ross violated federal law in providing conflicting and untruthful rationales about its potential inclusion. Furman’s conclusion: The Trump administration misled Americans about the intent of the citizenship question, and willingly risked the integrity of the decennial census in order to push it through, as a political matter. But the controversy over the question, fueled by President Donald Trump’s anti-immigrant rhetoric and fears that the census could be weaponized against marginalized communities, isn’t over yet. The Supreme Court could still hear the case, and the seeds of distrust in communities skeptical about the question have already been sown. The case before Judge Furman did not appear to be a terribly tricky one. When, in late 2017, the administration began making a public call to ask people about their citizenship—which is a question on a smaller annual survey, but not the decennial census—the story was that the Justice Department needed the question in order to better enforce the Voting Rights Act, since the “citizen voting-age population” is the main measure of the size of political districts. But emails and official documents that emerged during lawsuits to stop the question’s inclusion in the census revealed that Ross pushed for it and then sought rationale where he could to implement it. Despite the fact that the Justice Department already has citizenship data that has proved reliable, enforcement of the VRA became the main post hoc rationale for including the question on the next census. From the outset, immigration and civil-rights groups were suspicious of the question. Per the Constitution, the census is intended to count all residents, regardless of citizenship. Activists reasoned that the citizenship question was a way to get around that requirement and was either intended to intimidate or target immigrant communities and undocumented immigrants, or would have that effect nonetheless. Many feared that reluctance to answer the question would lead to an undercount of immigrant families, and that administration officials knew of and welcomed that risk. Scrutiny from the court basically confirmed all those fears. After dismissing internal reports that the question would surely lower response rates, Ross and his aides pushed the question anyway, and appeared to obfuscate the reasons for pursuing the question. In his decision, Furman stops just short of saying that Ross lied to Americans about the intent of the citizenship question and the data he received on its potential effects, but it’s about as strong an implication as there can be. Furman ruled that Ross violated multiple laws related to the conduct of the census and to how the executive branch can create and implement new rules. But on the plaintiffs’ other claim, that Ross’s intent was discriminatory, the court demurred, since Ross himself was saved from deposition by a Supreme Court stay. “It is impossible to know if they could have carried their burden to prove such discriminatory intent had they been allowed to depose Secretary Ross, as the Court had authorized last September,” Furman wrote. The Supreme Court will take up the matter of whether or not Ross can be compelled to be deposed in February. Civil-rights organizations, many of which submitted briefs on behalf of the immigration groups that filed suit against the Commerce Department and the Census Bureau, immediately celebrated. “The Trump administration violated the law by adding a question to the 2020 Census that will undoubtedly reduce participation by immigrants and people of color,” said Vanita Gupta, the president and CEO of the Leadership Conference Education Fund, a civil-rights organization, in a statement. “We cannot afford to have millions of Latinos and other Americans missed in the nation’s decennial count,” added Arturo Vargas, the CEO of the National Association of Latino Elected and Appointed Officials Educational Fund, in another statement. At this point, time is of the essence. The census has already run up against a gantlet of administrative issues, and it’ll have to get the final forms to the federal printers by next summer. Even without the drama of the citizenship question, the official preparation process for this version—which will be the first online census—would be hectic. The Trump administration would normally have to go through a lengthy appeals process to and through the Second Circuit Court of Appeals, in a case that could go to the Supreme Court at some point, but it’s likely that federal officials will request that the courts expedite a decisive review in the interest of getting the census done on time. One potential avenue, says Lowenthal, is expanding the scheduled Supreme Court proceedings on the issue of Ross’s deposition, and using it as an endpoint for outstanding legal questions involving the administration of the census, including the citizenship question. As Ian Millhiser at ThinkProgress notes, if the question does get to a full Supreme Court review, it will be a major test for the independence of the conservative majority. “Furman’s caution may serve [the plaintiffs] well in the long run,” Millhiser writes, since “Republicans on the Supreme Court are extraordinarily hostile to claims that a public official acted with racist intent.” They are more responsive to violations of the Administrative Procedure Act, which Furman found Ross had done. It would be difficult by jurisprudence alone to predict that the Supreme Court would overturn Furman’s decision, but the fact that the citizenship question is Trump’s own pet policy will certainly add pressure to the potential proceedings. As Dara Lind writes at Vox, even if the federal government does not find its desired result in the Supreme Court, there still may be damage done. “News stories about what the administration might do tend to persist as rumors in immigrant communities even when the administration isn’t actually doing it,” Lind notes. Publicity about the citizenship question, the disinformation from Ross, and the clear anti-immigration bias from Trump and other authorities could have poisoned the well and reduced communities’ already shaky faith in enumerators. It’s the Census Bureau’s own responsibility to alleviate those problems. One of the largest parts of the 2020 census budget is for information and advertising campaigns designed to get low-response communities to take the census. But, thanks to the citizenship question, the effort will be a bit more difficult now. And that’s without the prospect of a continued fight in courts, or the possibility of officials or Trump himself publicly casting doubt on the census and informally disrupting the advertising effort. All roads ahead make the 2020 census at base a little shakier, and increase the chances of major discrepancies or problems come next year. And that would appear to be by the Trump administration’s design. Natasha Bertrand contributed additional reporting to this article.